You can switch between these two modes by clicking the green 'Kiosk' button then 'Settings' ( Kiosk > Settings > 'Mode' tab.) refer to the table below for a comparison of different modes of the Kiosk main interface. 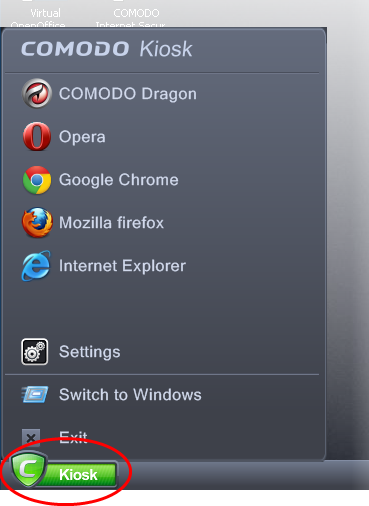 Run browsers that are installed on your system. Refer to Running Browsers inside the Virtual Kiosk for more details. Configure the Virtual Kiosk by clicking 'Settings'. Refer to Configuring the Virtual Kiosk for more details. Clicking the keyboard icon on the system tray opens a virtual keyboard that can be used to input confidential data like website user-names, passwords and credit card numbers. To display the numeric keypad on the right, click the >> button at the top of the keyboard. Clicking the 'Volume Control' icon at the system tray enables you to control the system volume. Right-clicking on the task bar and selecting 'Watch Activity' opens the 'Windows Task Manager' to view your computer's performance, close unresponsive programs and to troubleshoot problems with Windows. To switch to 'Tablet' mode from 'Classic' mode, click the green 'Kiosk' button at bottom left followed by Settings > Mode and select 'Tablet Mode'. Mode A – Pure Tablet device - A touch-screen interface that will be familiar to users of modern smart devices. The home page displays a set of popular apps covering games, social media and networking. You can, of course, install your own apps from the app market. To install your own apps, click the App Market icon from the launch bar. You will be taken to https://chrome.google.com/webstore/category/home?utm_source=COMODO-Kiosk. Select the apps you want to install from the webstore. Mode B - Tablet device + Classic Windows – The home page displays the desktop items from your real system. 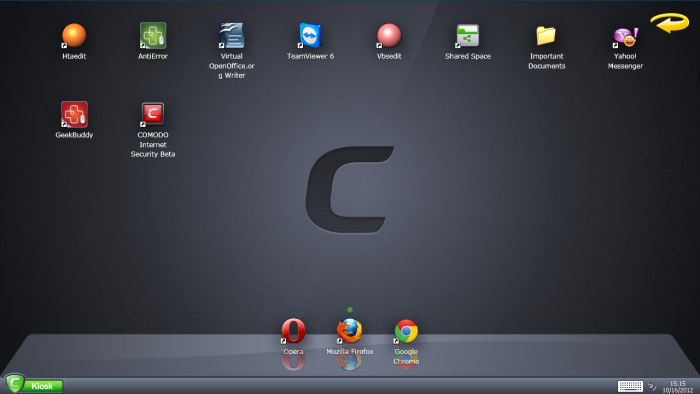 The task bar from classic mode is present along with the green 'Kiosk' button and the virtual keyboard. The launch strip will display all installed browsers. You can swap between the two variations by tapping the arrow at the top right. 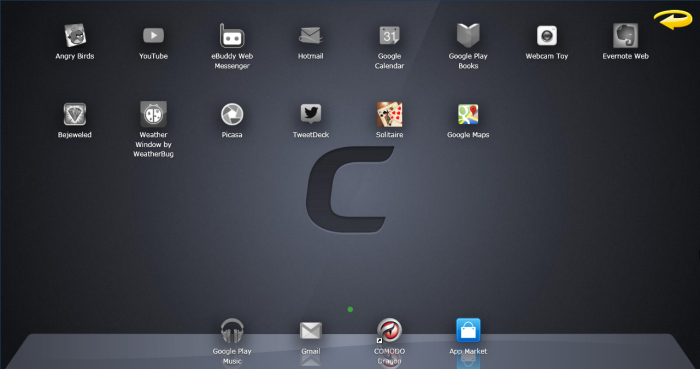 You can swipe the home screen in both left and right directions to navigate between successive home pages.